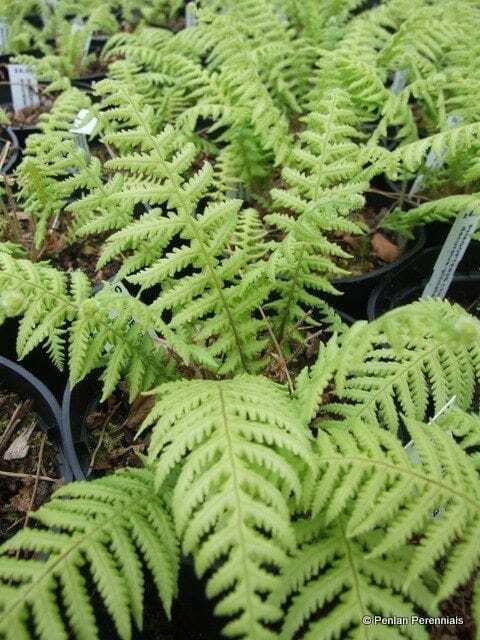 The Japanese beech fern is a superb choice for shady waterside or wet woodland area. The fronds are lustrous with a pale green underside and the rachis broadly winged with shallowly-lobed pinnae. It has a running habit but on short stems so is easy to control. It makes excellent groundcover and remains semi-evergreen in mild winters. It is best grown in moist shade or semi-shade and is ultra hardy and both pest and disease resistant. It is seldom found in nurseries but deserves to be more widely grown. Sometimes seen under the synonym Thelpyteris decursive-pinnata. Organically grown in peat free compost. Cut back all foliage to the ground in spring. Propagate by careful division. Sow spores that are freshly ripe.